Her daughter Bristol's teen pregnancy: Palin deflects accusations of hypocrisy (i.e., she didn't sufficiently teach abstinence to her own daughter) by noting that those accusing her are admitting that she has principles, since hypocrisy implies non-adherence to principles. Discussing Bristol provides plenty of opportunity for discussing family values in general (besides appearing on "Dancing with the Stars", Bristol tours high schools telling other teens that abstinence would have served her better). Her son Track's service in Iraq: Palin finds numerous opportunities to glorify the American military; to glorify her son's selfless service to America; and to glorify the Stryker Brigade in which he serves. If you're into glorification of the military, you can expect a lot of it from Palin in 2012 based on this book. Her infant son's Down Syndrome: Palin discovered her son's affliction during pregnancy, and considers it a message from God that she and her husband Todd handle the difficulties which will follow. Politically, Palin gets the opportunity to apply her pro-life ethics and to describe those ethics in numerous related contexts. However, the details of policy pale in importance compared to the style of the book: Palin positions herself as the female Ronald Reagan by imitating his folksy anecdotal style. Reagan famously kept a file of old clippings from popular magazines, which he quoted whenever asked for sources of his policy ideas (as lampooned in "Doonesbury", Reagan cited popular magazines like "The Reader's Digest" from the 1950s as sources of political wisdom). Reagan also invented the ingenious method of introducing every major policy with an affected person (instead of just saying "We need policy X", Reagan would have an appropriate person in the audience and say, "Jane Doe suffers from Y and Z and demonstrates why we need policy X", while all the cameras would focus on a smiling Jane Doe). Palin modernizes the down-home anecdote, or as she calls them in the introduction, "bits and pieces of Americana". She cites everything from the cartoon "The Incredibles" (p. 69) to the fictional character Jefferson Smith (the protagonist of "Mr. Smith Goes to Washington", p. 3), from the Reader's Digest (p. 45) to The Onion (a spoof newspaper, p. 99), to the Cowboy's Prayer (written by the first Poet Laureate of South Dakota, p. 231). Flip through the book's pages and you'll find dozens of lengthy indented excerpts from sources such as John F. Kennedy (p. 70), Alexis de Tocqueville (p. 65), Margaret Thatcher (p. 133), and of course Ronald Reagan (p. 67 and more in our excerpts). And plenty of lesser luminaries and regular citizens as well, since Palin is no elitist who only cites Alexis de Tocqueville (and certainly this elitist reviewer was impressed that she could!). These anecdotes, carefully documented and recorded in this book, will be called "inspirational" by her supporters and "sappy sentimentalism" by her detractors--and they will serve as Palin's standard stump responses to tough questions in the 2012 race. In summary, this book is not so much a policy preview of 2012 as it is a stylistic preview. Palin is running, and running well. Her hit TV show "Sarah Palin's Alaska", is every political adviser's dream: free positive publicity over many months. And her 2010 endorsements (detailed in the chapter in this book on "Mama Grizzlies") mean she has plenty of political chits to cash in during the upcoming race, including several new members of the House and Senate. 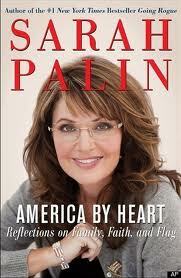 This book demonstrates that Palin's preparations for 2012 are well-considered and well under way. Carly Fiorina: Endorsed as pro-life, fiscal conservative "Mama Grizzly". Sarah Palin: Supreme Court oath: impartially apply Constitution. Sarah Palin: Supported 1990s TV ad: "Life: What a Beautiful Choice". Sarah Palin: New feminism: pro-woman, pro-life sisterhood. Sarah Palin: "No thank you" to federal dollars with fat strings attached. Barack Obama: Constitution stained by nation's original sin of slavery. Eric Holder: Only a nation of cowards won't come to grips with racism. Sarah Palin: America follows faith in how we treat special needs kids. Sarah Palin: Slavery in Constitution was a lasting shame for a century. Sarah Palin: Women's movement was "seat at table"; now "control table". Sarah Palin: I am a feminist, and grateful beneficiary of Title IX. Barack Obama: OpEd: Bailouts of GM & Wall Street are crony capitalism. Sarah Palin: I fought against crony capitalism as governor. Sarah Palin: All "winners" creates generation of entitled little whiners. Dan Quayle: 2010: 18 years after Murphy Brown, "Dan Quayle Was Right". Pat Moynihan: 1960s: impact on blacks from rise in out-of-wedlock birth. Sarah Palin: Mistake to assume teen daughter was a "good girl". Sarah Palin: Founding Fathers took strong families for granted. Sarah Palin: On Down baby: God won't give me something I can't handle. Ronald Reagan: 1987: People surprised that Soviet Union HAS a constitution. Ronald Reagan: US has no territorial ambitions despite military might. Milton Friedman: Chain of producers making a pencil need not like each other. Sarah Palin: Government is unnecessary for economic cooperation. Barack Obama: Constitution says what states CAN'T do to you. Newt Gingrich: Constitution begins "we the people" not "we the government". Nikki Haley: Endorsed as commonsense conservative "Mama Grizzly". Ronald Reagan: 1982: Agreed with Indiana resolution against paternalism. Sarah Palin: 1950s push for AK statehood based on lack of representation. Nancy Pelosi: We'd have to pass ObamaCare bill to find out what's in it. Sarah Palin: ObamaCare should focus on helping doctors via tort reform. John McCain: Vietnam POW: Ashamed of signing false confession. Mike Bloomberg: Supported building mosque near Ground Zero. Sarah Palin: Calling Vietnam vets "baby killers" was shameful history. Sarah Palin: If you love your freedom, thank a vet. Sarah Palin: Tragic mistake to allow mosque near Ground Zero. Antonin Scalia: Founders engaged in explicitly religious official acts. Barack Obama: American exceptionalism is same as any other exceptionalism. Barack Obama: 2008 Super Tuesday: We are the change we seek. George W. Bush: Prayer and religion sustain me. John Ashcroft: It's against my religion to impose my religion on others. John F. Kennedy: 1960: separate Catholic identity from public life. Mitt Romney: Freedom requires religion just as religion requires freedom. Ronald Reagan: Freedom is never more than one generation from extinction. Ronald Reagan: 1980s: Soviet leaders openly repudiate religion. Sarah Palin: We are free as consequence of being made in image of God. Sarah Palin: American exceptionalism based on idea of right to be free. Sarah Palin: McCain is a genuine American hero for enduring Vietnam. Sarah Palin: Tea Partiers love America & dislike what's happening to her. Sarah Palin: "Mama Grizzlies": tough candidates also raising families. Sarah Palin: Everything worthwhile comes through effort. Sarah Palin: Fought each Xmas as mayor to keep Jesus manger in Wasilla. Sarah Palin: Elites in "lame stream media" consider Americans alien. Sarah Palin: We are a prayerful country. Sarah Palin: I label myself a "Commonsense Constitutional Conservative". Susana Martinez: Endorsed as "Mama Grizzly" by Sarah Palin. Tea Party: OpEd: we love America & dislike what's happening to her. Ted Stevens: Survived 1978 plane crash that killed his first wife. Michele Bachmann: Endorsed as small-government, low-tax "Mama Grizzly". John Kerry: My faith is why I fight poverty and protect the earth. Mitt Romney: My faith would inform my presidency.